This image using color data obtained by the framing camera aboard NASA's Dawn spacecraft shows Vesta's southern hemisphere in color, centered on the Rheasilvia formation. Rheasilvia is an impact basin measured at about 290 miles (467 kilometers) in diameter with a central mound reaching about 14 miles (23 kilometers) high. The black hole in the middle is data that have been omitted due to the angle between the sun, Vesta and the spacecraft. The asteroid Vesta's many flavors are revealed in a new rainbow-colored image taken by a NASA probe in orbit around the space rock. The new image of Vesta's southern hemisphere, snapped by NASA's Dawn spacecraft, uncovers a diverse world with many ingredients and well-separated layers. According to scientists, the images support the notion that Vesta is a so-called protoplanet that would have continued to develop into a rocky body like Earth or Mars if Jupiter's gravity had not perturbed the asteroid belt long ago. 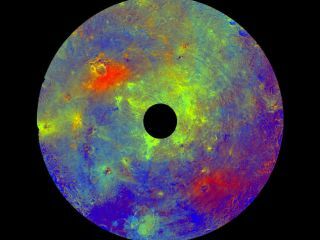 "Vesta's iron core makes it special and more like terrestrial planets than a garden-variety asteroid," Carol Raymond, Dawn's deputy principal investigator at NASA's Jet Propulsion Laboratory in Pasadena, Calif., said in a statement. The colors in the image were assigned by scientists to illustrate the different rock and mineral types. The varied compositions represent material ejected by impacts and geologic processes that have shaped the asteroid's surface. The black circle in the center is data that have been omitted due to the unfavorable angle between Dawn, Vesta and the sun, NASA officials said. Images from Dawn's visible and infrared instruments reveal that Vesta's surface contains the iron-bearing mineral pyroxene and a mixture of rapidly cooled surface rocks and a deeper layer that cooled more slowly. The different materials seen in this image correspond to topographic variations that were previously seen by Dawn. These observations of Vesta's rugged surface indicate a layered structure that has been excavated by impacts, the scientists said. "The distinct compositional variation and layering we see at Vesta appear to derive from internal melting of the body shortly after formation, which separated Vesta into crust, mantle and core," Raymond said. The AGU presentation also included new video footage exploring a hill on Vesta that appears to be made up of a darker material than the rest of the asteroid's crust. The movie was created by David O'Brien of the Planetary Science Institute in Tucson, Ariz.
Vesta measures 330 miles (530 km) across, and is the second-most-massive object in the asteroid belt between Mars and Jupiter. The $466-million Dawn spacecraft launched in September 2007 and arrived at Vesta on July 15, 2011. The probe will study Vesta for a year before departing in July 2012 for the asteroid Ceres, the largest body in the main asteroid belt. Ceres spans approximately 590 miles (950 km) across and is so large that it is considered to be a dwarf planet. Dawn is expected to arrive at Ceres in 2015.